Beautiful aluminum + RGB backlight. 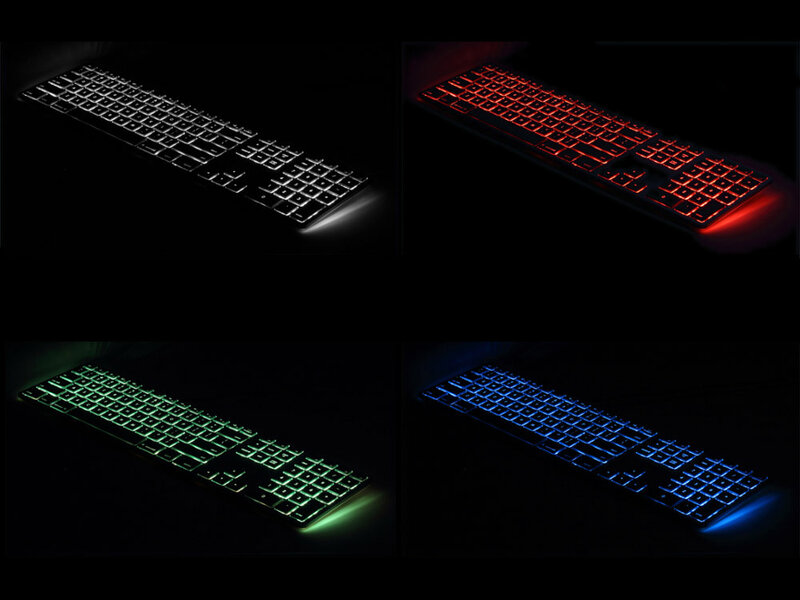 With a beautiful black anodized aluminum enclosure, RGB backlighting, and a sleek ultra thin design, we've created a PC keyboard that epitomizes style & quality. For White, turn all the way to the left, or all the way to the right - passing through a rainbow of colors in between. It�s the ultimate in simplicity & flexibility. Too much Blue-light exposure at night is known to negatively impact your melatonin levels. This can shift your body�s natural time clock - leading to poor sleep and various other health issues. Turning the Color Dial all the way to the left or right gets you White (which is 100% Red, Green, and Blue). BUT when you turn the Dial back, it preferentially reduces the BLUE component of White, resulting in softer Whites, that are more Yellow (and better at night). Dial it back a little further, and you have 100% Yellow (0% Blue). Dial it back further still, and you get 100% Red - which is the color that least impacts sleep patterns. Reducing the backlight brightness is also advisable (see below). Hold down the -/+ backlight key, then press + or - to increase/decrease the brightness. You can also select a brightness level directly, by holding down the -/+ backlight key, then pressing a number (1 = 10%, 2 = 20%, etc.). -/+ backlight key and Esc turns off the backlight. Typing is tactile & responsive. With a generous 2mm of key travel, typing feels as tactile and responsive as any of the best laptop keyboards. USB port for your mouse / flash drives. The built-in USB 2.0 port is perfect for connecting your favourite wired mouse (or wireless dongle). Tab key on the number pad. A Tab key on the number pad is handy when you need to enter numbers on a form, web page, or spreadsheet. Dedicated keys for volume control let you comfortably adjust the volume. And when (unexpected) interruptions happen, Mute is a simple keypress away. Excellent product and service, wouldnt hesitate to recommend both. I work at a keyboard all day, every day, writing code ... over the years I have learned what tools I like and don't, and my keyboard is one of the most important tools on my list to be right. This keyboard is extremely well made - solid, no give under pressure (its aluminium, duh). The keys are chiclet, and give a very positive action without having too much travel. The RGB is extremely well designed - the difference it makes in low light is amazing (especially for the odd game!). I had some bother with the keyboard disconnecting when I plugged it in first time, but after rebooting the machine it has been solid ever since. Highly recommended keyboard, and indeed supplier! GReat keyboard, if rather expensive. 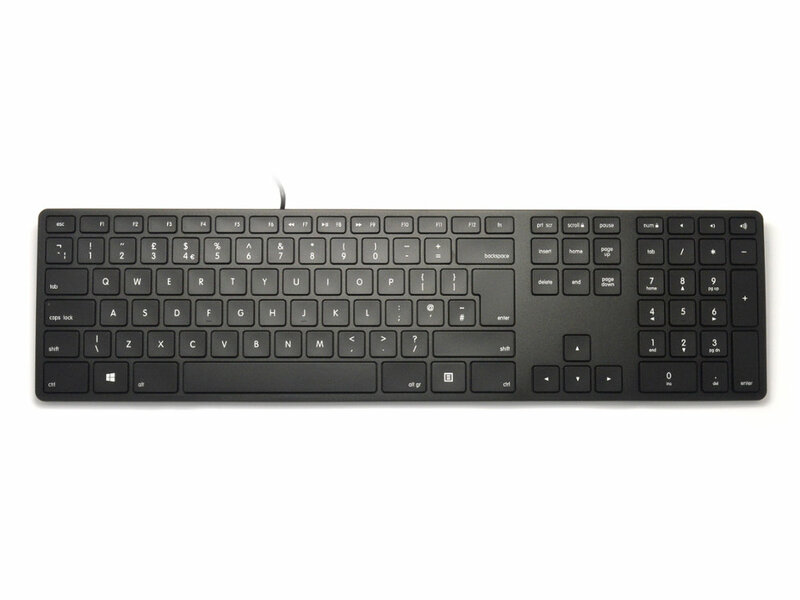 I bought this keyboard to replace the disgracefully bad keyboard supplied with an Acer PC, and it is a revelation. Pretty much as good as the Apple keyboards which are excellent too, this now somewhat compensates for the less enjoyable experience of using Windows!